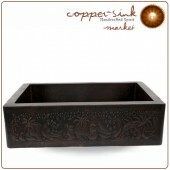 One of our most successful lines of products, our kitchen copper sinks collection. 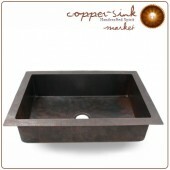 We have available for you undermount copper kitchen sinks, farmhouse copper kitchen sinks, and apron kitchen copper sinks. We use a strong caliber (16) in our kitchen copper sinks, to make them strong and durable, as they are subject to a functional and daily use. In recent years, copper sinks have become increasingly popular for kitchen designs as the general public has learned more about the great health benefits that using these sinks can provide. Copper and its alloys are naturally anti-microbial, making a copper sink far less likely to expose you and your family to food-borne bacteria. As more and more news emerges concerning drug-resistant bacteria and microbes, safeguarding your family against illness becomes a growing concern. Installing a copper sink in your kitchen can help you stack the odds in your favor, reducing the likelihood that you or your family will become ill from food borne microbes or bacteria. 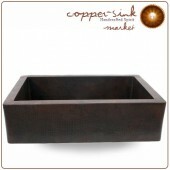 Our undermount copper kitchen sinks are sleek and attractive, allowing you to have a continuous kitchen surface design. Installed correctly, these kitchen sinks can provide years of leak free performance, all while offering you the durability and protection from illness that strong caliber copper sinks can provide. 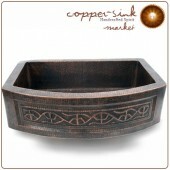 Farmhouse copper sinks can provide rustic charm to your home, giving the kitchen a traditional, bucolic feel. 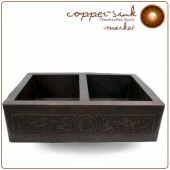 In addition to their stylistic advantages, these sinks, made of sturdy copper, can provide you with decades of service. 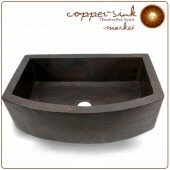 Easy to clean and maintain, our copper sinks in the farmhouse style will likely be the lowest-maintenance part of your kitchen, requiring only regular cleaning. If you’re looking for an attractive, durable kitchen ideas for a sink that provide a visual link to the traditions of the past, installing one of our farmhouse copper kitchen sinks is the best option in terms of aesthetics, reliability and safety. 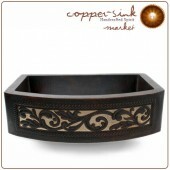 Apron kitchen copper sinks are another way you can provide your home with country-style appeal. Apron sinks have an exposed front that usually juts out past the front of your kitchen cabinets and are typically deeper than regular kitchen sinks, making them more useful for big cooking projects. Most of the time, apron sinks are single well, but there are a variety of double well models available. In most apron sink designs, the faucet and other sink accessories are mounted into the kitchen counter behind the sink as apron sinks usually do not have holes for faucets or accessories. As with our other kitchen copper sink models, our apron kitchen copper sinks are made of tough, durable strong caliber (16) copper, making them a worthwhile home investment. Having a strong caliber in your kitchen sink is important, as daily wear and tear and abrasive cleaning chemicals can easily take a toll on kitchen sinks of a lesser caliber. 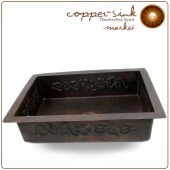 Our kitchen copper sinks and farmhouse sinks are of the highest quality and will provide you with an attractive option for your kitchen ideas that are easy to maintain and that also protect you, your family and your guests from food-borne illness.